I still haven't figured out just what this is. The grip is probably mis-matched from something else. Your mystery piece looks like it may be from the Philippines or Indonesia. I think the handle is original to the piece, but I am far from knowledgeable in that area of collecting. I do have one Moro barong from the first half of the 20th century. I would like to acquire a nicer example one day. PS--I love that police saber! Your mystery piece looks like it may be from the Philippines or Indonesia. I think the handle is original to the piece, but I am far from knowledgeable in that area of collecting. With that hilt, I'd say Indonesian. From limited experience and limited reference materials, I'd guess Javanese. You could call it a "pedang bentok". Or some kind of "golok". 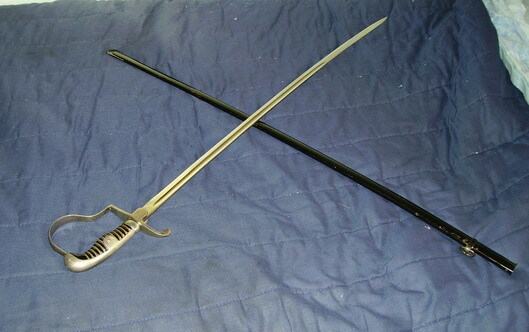 (Either would be correct, but pedang bentok is more specific, "curved sword", "pedang" (and similar words in other Malay dialects/languages) is "sword". 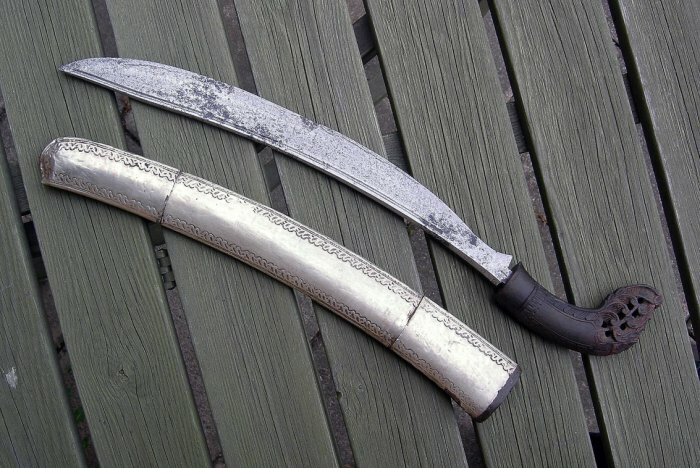 "Golok" means single-edged cleaver/chopper.) Or, if Philippines, "bolo" (with the same generic meaning as golok). Very common to see hilts and blades being replaced or exchanged, so I don't know about "original" for the handle. Doesn't look like a fake composite. At first glance, the scabbard looks like it might be made from a cut-down longer scabbard - assuming that what look are like seams are seams. Will take photos of some bits over the weekend for you but in the meantime here are a couple of unusual "curved"
pieces. The Kukri was made about 1900 in Himal Pradech a traditional centre of Kukri manufacture lying between the Garhwalis and Jammu and Kasmir peoples. The decoration may have been done by a goldsmith rather than a Kami (smith). The sun (Surya) and moon (Chandra) mark represent the male and female aspects or in Bhuddist culture compassion and wisdom. The meaning of the 'palm frond' symbol is unknown. The scabbard chape is silver. This piece would have been made for a wealthy member of society. The short sword is from Trabzon/Trebizond on the Black Sea N.E. Turkey. The hilt is horn and this piece is dated Gregorian 1908. Trabzon blades are noted for the complexity of their fullers and I have added a close up in order that this aspect can be better seen. I hope these are of some interest and I will post more 'curved blades' soon. A couple of Tulwars as promised. Blades are 32/33 inches and extremely sharp. Hilts and blades are different, one has a double fullered blade and is very unusual in having a vegetal pattern chiseled into the steel the length of the spine and the topmost fuller. These are good solid fighting blades and handle well. I have added a photo of an axe which I thought may interest you. The rattan shaft is 37 inches long and the head is 6x9 inches and in common with most Indian weapons I have handled is very sharp. This is an early 19thC or quite possibly earlier Bullova axe attributed to the Khond peoples of the Chota Nagpur region. It is very much a weapon of war and not ceremonial although they are known to have been used occasionally in animal sacrifice. I hope these are of interest. Jonathan some 18thC British curved blades to keep yours company. A contemporarily modified military hanger i.e. minus the boat shaped guard normally associated with this type. A slot hilted hanger with silver guard and pommel and ivory grip wound with silver wirework. A 1796 Light Cavalry officers sabre with pre 1801 Royal Arms made by Osborn, been in the wars a bit but still an intimidating blade. Your photos are excellent and your collection is very impressive. As a collector of British swords I am of course drawn to your 18th century British blades, but I am equally impressed and enamored with your Indian swords, the kukri, and the Trabzon short sword--I've not seen one like it. The tulwar look to be in excellent condition. I often see less expensive antique tulwar in very sad shape and quite dark with age. When I acquire one I hope to find one in a condition similar to yours. Thank you very much for posting them. By the way, do you know anything of tulwar used by Indian troops of the HEIC or presidency armies during the 19th century? How about English-made tulwar? PS--Have you had a chance to read Sword Fighters of British India by D.A. Kinsley? It is a fascinating compilation of firsthand accounts of sword fighting in the context of the many colonial conflicts in India from the late 18th century through the 1857 rebellion. Here are two that I sold a few years ago. 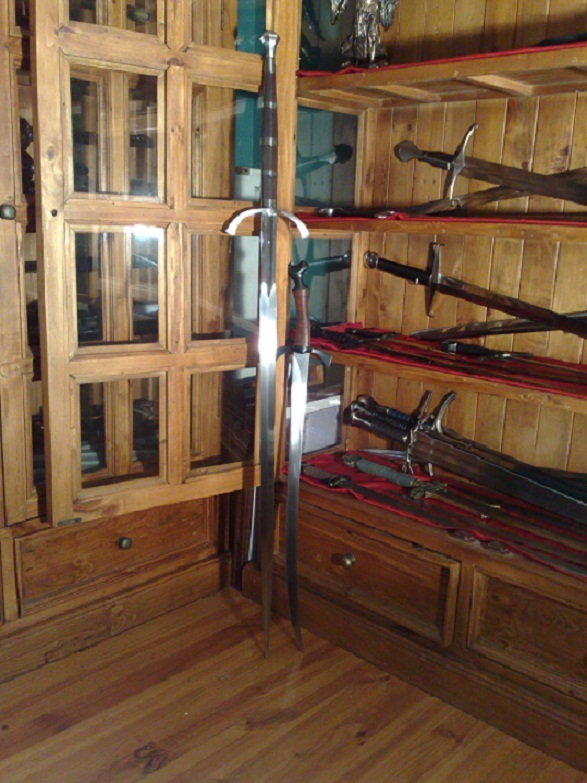 I don;t regret selling them because I used the proceeds to buy other nice swords, but it is a shame I needed to sell them in order to do so. 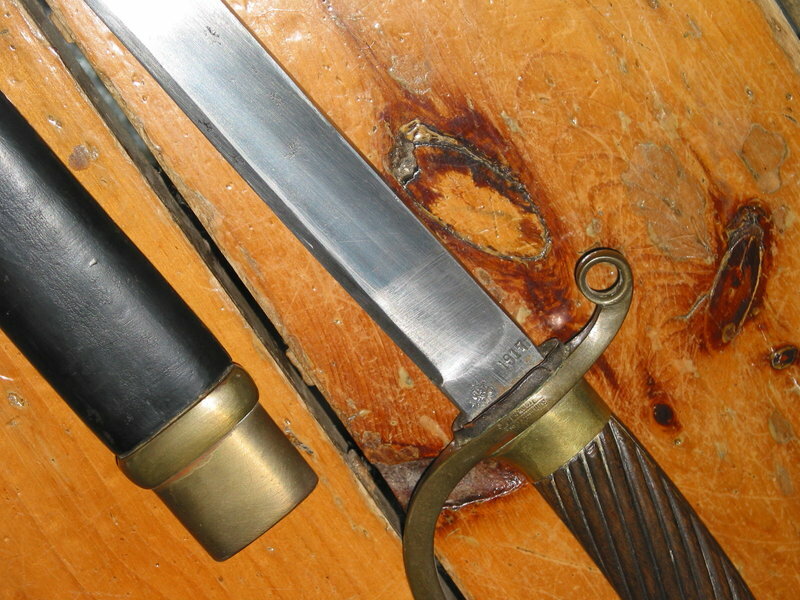 First is an Italian M1860 cavalry trooper's sword. This example was made by the Solingen firm of Schnitzler & Kirschbaum. It is a huge beast of a sword and I'd love to own another one some day. Next is a British Pattern 1821 Light Cavalry Officer's Sword with a pipe back blade and a very nice yelman. The blade was etched with the cypher of Queen Victoria and dates to 1837-1845. Ah, that's who bought it from the private sale. It was picked up shortly after the hooved leafblade went, and I had wondered who got it. I had a hunch the Albion Dane was enormous, but, wow. In it I have the best blades and axes in my collection, some are new reproductions and some are antique. Most are straight but I have a few that are curved. This is my Jambiyia, bought by my uncle about 25 years ago in Yemen during a business trip. I got it as a birthday gift two years ago along with a russian marine saber, a bayonet and some other nice blades from his collection. It's lost its' sceath which isn't a big loss since it was of much poorer quality than the dagger and may have been made as a replacement anyway. I'm planning on making a new one that corresponds to the classic Jambiya sceath design. 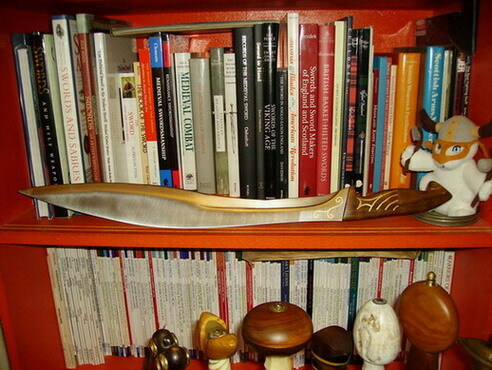 Here`s my, Vladimir Cervenka,Sinclair hilt, dussage/cutlass. 1. WWII German dress sword by F.W. Holler of Solingen. 2. Do Kopis/Machairas/Falcatas count? They're curved! 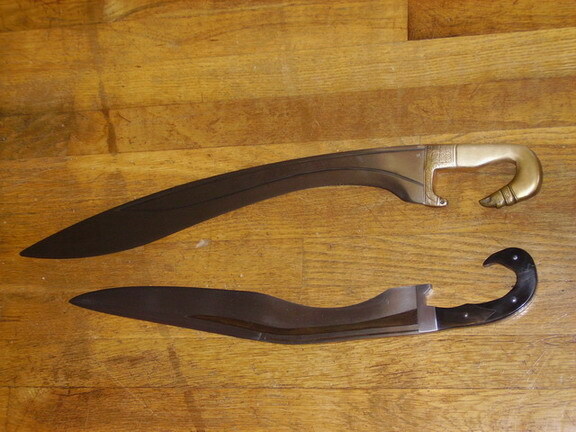 Anyway, here's two, a Del Tin falcata (top) with an Iron Age Armoury custom crow-head falcata. 4. Paul Holwell Horsehead Falcata. Here are some more.... a Tulwar (an actual antique, no longer in my possession, one of very few swords I somewhat regret selling) and a Scorpion Swords and Knives Falcon Alexander kopis. I just picked up this Albion Knecht,customized by Christian Fletcher. Time to cut something with that one, Karl!